While these general Vastu design guidelines will give you a good idea about how to design your Vastu home, it will still be necessary to consult with a Vastu expert. Vastu is an extensive science. There is a broad spectrum of conflicting opinions among Vastu experts. Disagreement often circles around the desirability of facing things East or, secondarily, North and an aversion to facing things South (and perhaps to some degree, West). Any direction can work and much of this is a function of the individual living in the home. A Vastu expert can help you with this. We are including some points that are not generally agreed upon. Different Vastu groups have different opinions. This list would be changed in a number of different ways depending upon the school of thought of the editing Vastu expert. We recommend favoring the side of safety first, keeping all perspectives satisfied whenever it is practical to do so. For example, if one system says to not face South and the other says facing South can be alright, perhaps just avoid South so that the final design would not offend advocates of either system. By adhering to these points as best you can, you can get the basic floor plan down and then send it to a Vastu expert to quickly review it for any comments. There are usually some refinements. It is common to work on it more and perhaps go back and forth a couple of times before it is sent again for final preparation for the draftsman. When you begin your design, line the house up with the cardinal directions (N,S,E,W). Slight adjustments to this will be made by your Vastu expert and is dependent on the direction the front door is facing. Begin with a rectangle of 81 modules with 9 modules on each side (9×9=81). Graph paper can be used to assist you in counting the modules or you can use a computer program such as Punch Home Design. Pick a module size that works for you. A Vastu expert will fine-tune the exact module size of your home after you get your basic design. The center module is called the Brahmasthan and is the heart of the home. The 8 modules around it create the greater Brahmasthan which, including the center, is composed of a total of 9 modules. Some say taking care of the Brahmasthan is 90% of Vastu. Axis: An imaginary line running down the center of the house from N to S and another from E to W is important. They should be unobstructed by walls. Windows or doors of 1 ft. x1 ft. or larger at 4 ft. minimum elevation will serve as an opening for the line. However, bigger is better. Another line is determined by the front door and runs directly from the front to back of the house. It too should remain open. There should be no fireplaces or bodies of water (like a tub or sink) on these lines. Some say East-facing homes are the most auspicious. Then, North-facing. Then, West. And finally, South. Many Vastu designers avoid South-facing homes altogether. However, a skilled Vastu expert can design an auspicious home facing any of these directions. Perfectly square shape is good for temples and homes. Most Vastu experts say the house should be wider than it is deep, though not too long and narrow. Though some highly respected Vastu experts say this is not necessarily true, for our purposes, we can go with the majority. It is important for the house to appear balanced, or even symmetrical, from the outside. The home should be pleasing to the eye, both indoors and out. Pandit Prasad can give a time for: a) groundbreaking; b) placing the gemstones in the foundation; and c) moving in, as well as performing the pujas for these significant events. Also, a Vastu expert can give the proper location in the foundation for placing the gemstones. U-shaped houses open to the East are very good. Also, to the North is good. Some say U-shaped in any direction is good. The Brahmasthan is then outdoors within the U. L-shaped buildings open to the NE are good. In this case, the 9×9 grid of the Vastu is determined by the long walls and the Brahmasthan can be located outdoors. O-shaped homes with the Brahmasthan in the center are very good. The location of exterior doors is important. If you are facing the house from outdoors, the East door should be located in the module one over from center, i.e., the 6th module from the left corner. Facing the North side of the house from outdoors, the door is to be located in the center module or one to the right. Facing the West side, the 6th from the left corner. Facing the South, a door can be located on either module adjacent to the center, but not in the center module. Some Vastu experts prefer no doors on the South side. Ideally, the house is on a flat building pad or yard. The yard should extend out one or more modules, or fractions thereof, in all directions. The house is best located in the SW portion of the pad. If the pad slopes, it is best to slope to the East, NE, or North. Most experts say NW is also fine. A fence around the pad is required. Entryways into the fence area are determined from the Vastu of the yard proper, dividing the fence in the same manner as the home was divided into 9×9 modules to locate the doors. Like the pop-outs, a fence should align with the grid lines of the house. It can even be made of shrubs or flowers. 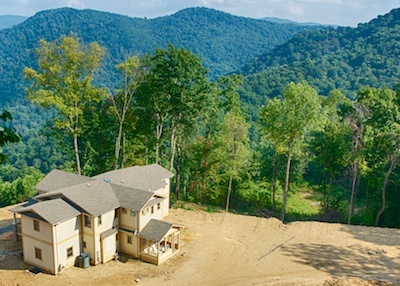 In steep mountain terrain, it is often not possible to have a flat pad around the home. It is good if the main floor is around belly button height above the grade of the Vastu pad (the yard). The ideal height must be determined by a Vastu expert. Water enters the Vastu pad and home from the NE. Electric and power from the SE. Sewage should just not go out on center lines or corners and should be carried outside the Vastu compound to the tank, i.e., not stored within the Vastu pad. Driveways going to the house are best curved clockwise. This is important if the driveway is within the Vastu pad. It is thought best for garages not to be attached to the house and located to the South of the house or West. Other locations can be worked out by your Vastu expert. Bodies of water or streams are best located to the NE of the house, avoiding water (pools, ponds, etc.) in other directions. This becomes less important the further away they are from the home and the smaller the body of water gets. Streams near the home best flow to the E or N or NE. 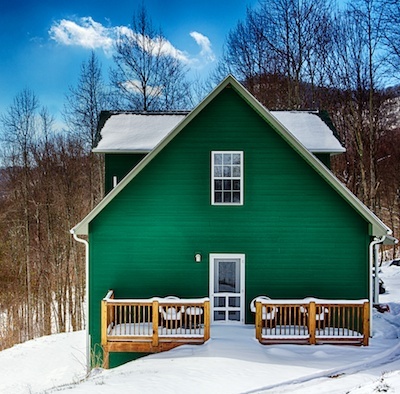 Lighter colors are considered desirable, including the roof material. Walls should be placed on top of the module (grid) lines or immediately adjacent on either side of the lines. If need be for closets, etc., modules can be divided in 1/3’s or even 1/9’s. For a given house, any combination of these wall locations can be used. The wall/grid relationship requires some sensitivity to consistency, as will be determined by your Vastu expert. Imaginary diagonals should be determined from the NE to SW corner and from the NW to SE corner. No bodies of water, like sinks, toilets, tubs, outdoor ponds, etc., should be on those diagonals. As you take the first step up a stairway, you should be facing South or West. If the stairway curves, it should go clockwise as you go up. Vastu experts sometimes make exceptions to this general rule. Fireplaces should not be located on the axis or along the front door axis. It is good to keep the SW corner of the home uncluttered, as with the NE corner. In fact, clutter should be avoided throughout the home. Vastu likes right angles. It is good to avoid diagonal walls and, to some extent, diagonal furniture arrangements. Fireplaces should not be in corners. These same rules are a bit less strict for basements. The house can be enlarged by creating pop-outs. They are located along the sides of the Vastu proper and can extend up to 7 modules along the Vastu, but should not go to any corner. They can protrude out up to 3 modules. That would allow for a maximum of 21 modules on a side for a total of 4×21=84 additional modules. It is best to locate toilets and stairways in the pop-outs and best for them to be away from the NE quadrant of the home. The main kitchen sink usually should not be located in a pop-out. Doors going to the outside can be located in pop-outs. 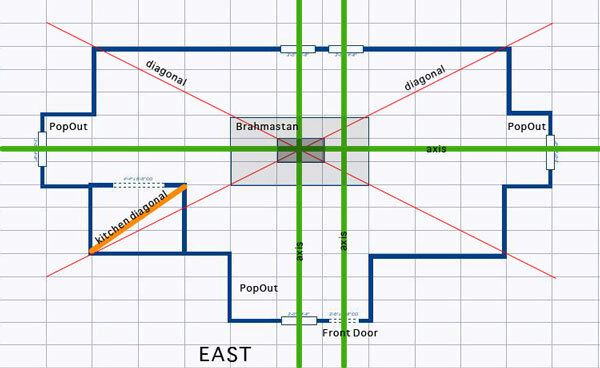 They need to align with the main entry door at the mandala line (i.e., the main 9×9 module Vastu of the home). The Brahmasthan should not be cluttered and should be left open and held sacred. Some say that whatever is in the center of the Brahmasthan dominates the home. Most feel it is best to leave it empty. No bodies of water or pipes or electrical lines should run within the 9 modules of the Brahmasthan. It is fine to have electrical plugs in the walls along the perimeter of the Brahmasthan. In our Vastu home, the experts also allowed some small overhead accent lights within the Brahmasthan. Some say it is good to demarcate the 9-module Brahmasthan and the one inner Brahmasthan with a different floor covering or some sort of border. Some like to put a small stand or table on the center square so no one walks through it. Others say this is not at all necessary. It is important to have a cupola with windows or skylight over the Brahmasthan center square or larger Brahmasthan (on the top floor) to let light in. Some like the top floor center Brahmasthan to be open to let light go down to a lower floor. Most say that is not necessary. The NE corner of the main floor is a sacred and peaceful area. Locate the meditation area (or library) there. The master bedroom is in the SW. The master office is in the SW also and they can be on different levels. The kitchen is in the SE. West is a good location for the dining room. The meditation room can, if needed, be part of a larger living room delineated by furniture arrangements. Some say it is good to sit facing East or North while eating. Some say West and South are okay. Others insist facing East is best, particularly for the head of household. However, many Vastu experts consider this to be superstition, saying different people will have different electromagnetic and cosmic relationship requirements. Some experts say that TVs or anything you spend time looking at are best against East or North walls, though West is okay. Most say this is not necessary. The headboard of the beds should be against an East or South wall. They should never be against the North wall. Some say the West wall is okay, so if you sit up to meditate in bed, you are facing East. Some say most pictures or statues of God should not face South. Some say it depends upon the God. Most say, when standing at a sink, you should be facing East or North. Kitchens are usually designed so you are facing East when at the main sink. Tub faucets and showerheads are generally against East or North walls. Toilets should be against North or South walls and are best separated from bathtubs with a door of some kind. An imaginary diagonal should be drawn from the SE to the NW corner of the kitchen. The stovetop and oven should be located in the NE half of that area. If the sink and stovetop are on the East wall, it is better for the stovetop to be closer to the SE corner than the sink. Please note: We encourage you to design your Vastu home with proper consultation. Attempting to design a Vastu home without relying on a Vastu expert is not wise. These are some general guidelines to get you in the ballpark. In some cases, a Vastu expert could take wise exception to what is stated here. Please keep in mind, we are not Vastu experts. However, we have worked with experts from a wide range of systems. We feel confident these points will greatly assist you in working with the expert of your choosing. We would like to thank Vastu expert, Michael Borden (641-472-2157 / vastuved@yahoo.com) for helping us with this information. You can purchase Michael Borden’s book, Vastu Architecture, on Amazon.